The CAWC (Medical-Lock Attendant) is a mandatory seven day training course for individuals who are assigned as Medical-Lock Attendants at worksite that requires personnel to work in a compressed air (CA) environment. List the roles and responsibilities of a Medical-Lock Attendant. Explain the medical condition of compressed air illnesses (decompression illnesses (DCI) and dysbaric osteonecrosis) and barotrauma. Carry out hyperbaric treatment using approved tables for neurological evaluation. Carry out compression of personnel before entering into compressed air (CA) environment. Apply oxygen first aid and chamber nursing. Apply different forms of life support (CPR & mechanical aids). Analyse health declaration form for all CA learners. A mandatory training course for individuals who are assigned as Medical-Lock Attendants at construction worksites or any place that requires personnel to work in a compressed air (CA) environment. No person shall be employed as a medical-lock attendant in a worksite where work in a compressed air environment is carried out unless he has received adequate training to familiarise him with the hazards associated with compression, decompression and compressed air illness and with the keeping of records under these regulations. A maximum of 12 learners per course. The learner must pass the written/practical assessment in order to be issued with the certificate of successful completion. 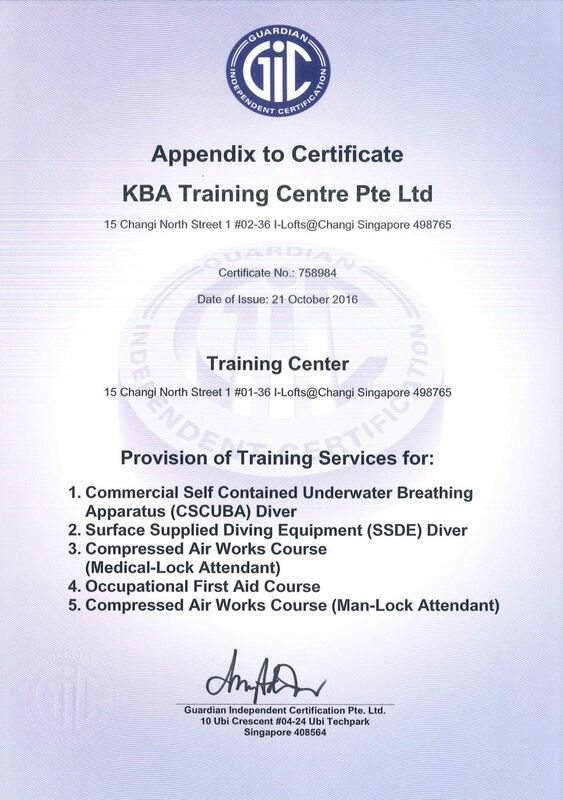 Course accredited under ISO 29990:2010 Standard. Failure to pass the written/practical assessment will render a “Fail” outcome for the learner and he must then retake the course before re-attempting the assessment. The total allocated time for the written assessment is 1 hour; for practical assessment is 3 hours. The passing mark for the written assessment is 60%; practical assessment is 100%. 1. Approved for Skills Development Fund (SDF) Training Grant (eligibility criteria apply)*; Absentee Payroll (AP) approved. The trainer was very upbeat which kept us focused. I enjoyed the the actual hands-on using the decompression chamber. I most enjoyed the interaction between everyone including the instructor.